If you are interested in having an in-ground pool, the best type of valves are the diverter valves as they are the ones with the best performance. These have a diverter inside that goes over the portholes when you need to close them and to the sides if you need to open them. Diverter swimming pool valves are available in two versions, the first one being a regular two-port valve that has one entrance and exit port and the second one is a three-port valve that has one entrance and two exit ports. This is also called a T-style valve, which offers greater flexibility than the former. These swimming pool valves can be used with above-ground pools too. Check valves are a smarter way of having better control over the flow of the water as they can both monitor it and stop any water backwash. They are available in two different types that do the same thing but in a different way. Starting with the flapper valve check, you have a mechanism that uses a flap, tensioned only on one side of the body – this allows for the water to be released only when there is enough water pressure. 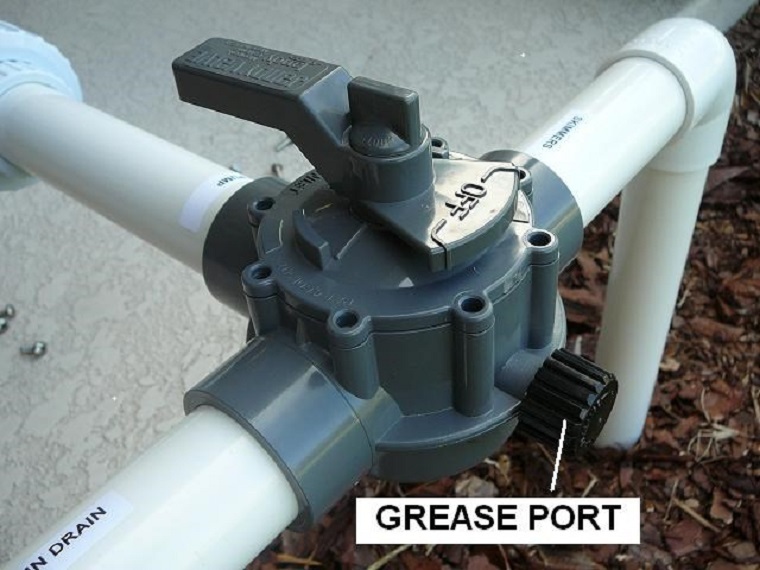 The second, more unique valve style, the spring check, has a plunger on one side of the body which is facing the water and it makes it go through the valve when the pool pump has built enough pressure. Both of these types of valves have the same spring tensions that you can choose from, with the standards being 220g, 450g, and 900g. With these valves, you get a simple design which is usually used as an on/off switch. These valves consist of a stem, handle, body and the internal gate which slides up and down depending on how you twist the handle. They have started to being used with above ground levels in recent years but in the early days, they were mostly used with in-ground pools. These two swimming pool valves do the same task but use different mechanisms. The butterfly valves use a paddle plate that will spin when you want to adjust the water flow. With ball valves, you have a copper sphere that has a cored center to allow water to pass through, but unlike butterfly valves, their mechanism isn’t in the path of the water flow at all times. What these have in common is the quarter turn of the handle.